These are just some of the headlines that we have been seeing in the media which are reflecting the current economic crisis that Bermuda is facing. Most Bermudians are hurting and are looking for some guidance and relief. The following information is an honest look at Bermuda’s economy and it is designed to educate you, the public, in making informed decisions about where we are, how we got here and what we need to do in order to make Bermuda the viable economy it used to be. • Risk of downgrading of the country. 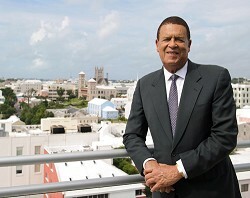 Bermuda has two pillars to its economy: International Business and Tourism. These sectors are what earn us our Foreign Currency Exchange which is the US dollars that are earned by Bermuda and is used to pay Government debt, private sector debt and all overseas transactions. Our Bermuda dollar is strictly for domestic use. All other transactions are done in US dollars. International Business represents 85 per cent of our economy generating foreign exchange earnings of over $1.9b in 2010. Tourism represents 4 per cent of our GDP and generated only $384m in 2010. As we can clearly see we need to embrace international business and its workforce as it is where we obtain the majority of our foreign exchange, the lifeblood of our economy. There are approximately 64,186 residents in Bermuda of which approximately 50,533 are Bermudian. As a result of past experience, in order to maintain a viable national economy, the national workforce (NWF) count must be a minimum of 40,000. At 40,000 NWF count Bermudians comprise approximately 27,000 and non-Bermudians approximately 13,000. In 2011 the NWF is dropping below 37,000 and we are unsure of the figure for 2012. Therefore, we have already dropped below a number that maintains the basic viability of our economy. The population of 50,533 Bermudians includes men, women, children, retired seniors, physically challenged, mentally challenged. Our birthrate has been steadily decreasing with only 572 Bermudian babies being born in 2006. Our aging population has been increasing. When we take all of these different aspects of the Bermudian population into account, we cannot fill all the jobs that are necessary to maintain a viable national economy. Non-Bermudians must be employed to fill the gap. In 2009 and 2010, guest worker manpower declined by an average 4.5 per cent each year and it continues to decline in 2011. We need to increase the employment level to 40,000 from its current and decreasing level of about 37,000. Since there is a limited pool of Bermudians from which to draw upon, we have no other alternative but to turn to the foreign workforce in order to stop the decline in the standard of living that Bermudians now see in jeopardy. The residual of $284.4m is what is left to use for maintenance of all public services, consultancy services, shortfalls in other revenue generating areas and planned capital expenditures. With the increase in civil servants, debt borrowing, decrease in revenue, and Government’s current budgeted debt commitment of $262,000 per day, according to the Auditor General, this residual will not be enough for Government to meet its commitments. In February 2011, $95,800,000 was budgeted for interest payments plus Sinking Fund contribution for fiscal year 2011/12. When the $200m is fully taken up, this will add about $16m to this year’s budgeted debt service costs which will then increase to about $111.8m per year or $306,000 a day. Government’s accumulated debt including obligations to underfunded pension funds and other Government controlled entities is $4.6 billion. The private sector has an accumulated debt of $5.2 billion. This debt is not Government’s responsibility but it is still debt that needs to be serviced and repaid. The graph below shows the Government’s revenue, spending, national debt and the national debt service cost. Note: Full debt service cost is made up of interest payments + 2.5% Sinking Fund contribution. The figure of $1.7m (found on the graph) for this period from Government is an anomaly and does not give an accurate assessment due to Government delaying the contribution to the Sinking Fund (the sum set apart periodically from the income of a government or a business and allowed to accumulate in order ultimately to pay off a debt) as well as interest on long-term debt being paid from the Sinking Fund for that period. In order to get a balanced view of the debt service cost the Auditor General’s figure was used. Could slump turn the election?